It's been a good year. 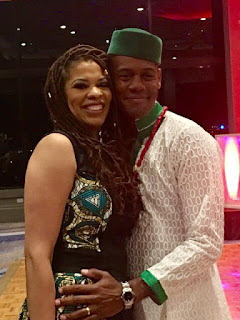 Nkechi and I both celebrated 40th birthdays, and threw a big party to commemorate the milestone as well as our impending 15th Anniversary, which we celebrate today. I was prepared not to write anything this year because I feel like there is much more that I'm learning about continuing to make a marriage work from marriage veterans than there is for me to offer in testimony. I also don't want people to see these yearly reflections as me positioning myself as some know-it-all. I am as flawed as anyone and get checked on the regular just like any other husband. I do however, feel compelled to keep writing these notes each year as a way of expressing thanks for the Grace that has been placed on our marriage and so that anybody who reads these notes who is newer in their journey may know the work that goes into holding it all together. to seeing Nkechi happy and feeling loved is as strong as it was 15 years ago. I want to thank our village for continuing to lift us up and encourage us as a family. It was overwhelming to see how many showed up to celebrate with us at our 40-40-15 party and those who sent well wishes from afar. It is a blessing to have you all in our lives and I hope that those who count us as friends know how much we love you. See you all next year.